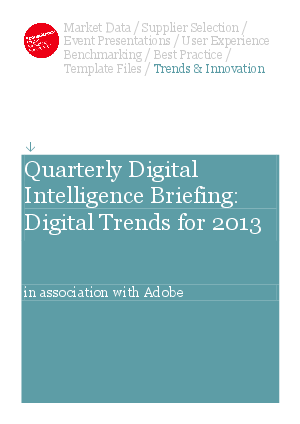 Our eighth Digital Intelligence Briefing, in association with Econsultancy, is now available for download. It highlights some key digital marketing trends for 2013, and outlines the challenges and opportunities which organisations are (or should be) paying close attention to this year. The report is based on a survey of around 700 business respondents, mainly from Europe and North America. The single most significant trend is the continued emergence of content marketing as a standalone discipline. There is now a widespread realisation that optimisation of all types of content is absolutely critical. Targeting and personalisation positioned among the top priorities for 2013. Compared to a year ago, social media engagement is lower down the list of priorities as observed by both client-side and agency respondents. Mobile optimisation is the most exciting opportunity in 2013 according to companies surveyed.